Sitting here on December 3, I’m listening to holiday classics, enjoying a coffee with my oh so favorite creamer (peppermint mocha) and enjoying the sunshine and warm breeze off the lake. That’s right, my windows are open, because oddly enough, our building shuts the air conditioner off in the winter, and it’s humid outside. Mariah Carey singing All I want for Christmas while all my windows and balcony doors are open in CHICAGO; the Mayans may know what they are talking and the end may be near after all. Speaking of the Mayans, they say the calender ends later this December, but the travel companies have no problem what so ever taking our money for a Mexico vacation in 2013. Besides a pretty scientific calendar, those Mayans are clearly business savvy as well. ANDRE BOCELLI at ALL STATE ARENA– This man is super talented and absolutely surreal to watch and listen to him sing. This was our 2nd time going to his concert (we went to Austin, TX for our 6th wedding anniversary in February) and each show was different and didn’t disappoint. Last night, we sat for two and a half hours while his voice silenced a sold out show at All State Arena. It doesn’t matter what your favorite type of music is, talent is magnificent to watch and hear in any capacity. Most songs are in Italian and the emotion poured into his performance makes you believe you actually speak a little Italiano for a short while. Four encores later, a long standing ovation and cheers could be seen and heard until the auditorium emptied. Blind since the age of twelve, he doesn’t disappoint and I strongly suggest saving your pennies to go see him next time he is near! There is not a better version of Ave Maria or Amazing Grace, I promise! FULL OF THANKFUL– This year, Peter and I hosted Thanksgiving in our teeny tiny place. We had 9 adults and 2 of the cutest babies sitting closely next to one another. To me, the more the merrier and I couldn’t have felt any more thankful for my family and friends that sat at our table. I hope everyone had a wonderful Thanksgiving giving thanks. THE ANNUAL CHRISTMAS CARD ATTEMPT– If you know me, then you know how I feel about Christmas cards. I LOVE THEM! I love getting them in the mail, and sending out, too! While I love the idea of Christmas cards, my husband loves the idea of a family picture. After being married for almost 7 years ladies, it’s called compromise. That is why we headed a little north of the city yesterday afternoon and attempted a Christmas picture. A tripod, a flash because the sun went down a little sooner than expected, hot dogs, a canine Santa hat and hundreds of shutter clicks later…I’m NOT confident at all we captured an adequate picture to send out. The dog wandered out of 3/4 of the pictures, my hair was in Pete’s face, and bikers speeding fast debuted in some. Stay tuned for this blog coming soon! 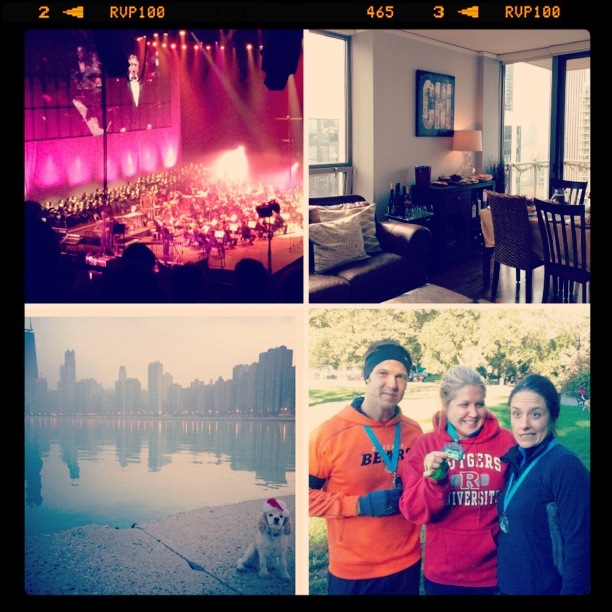 NEW YORK ROCK AND ROLL 8K– In October, we traveled to New York to celebrate my darling nephews 1st Birthday. Coincidentally, the Rock and Roll race series was in Prospect Park, Brooklyn and we ran an 8k. Peter, my sister Lisa, and myself all ran at different speeds (take a wild guess who was the slowest). At the end of what felt like a mini marathon, we got a medal! Folks, I’m not going to lie about why I sign up to run a race. It’s the t-shirt which I never wear again, but am so excited to get and the MEDAL! This picture was taken right after and I just adore that girl and her facial expressions!